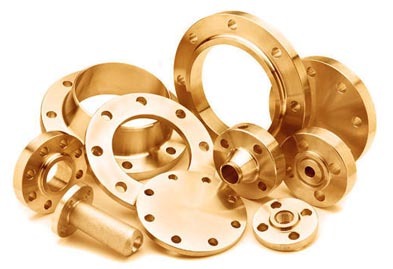 Jaydeep Steels are amongst the most reliable manufacturer, exporter, and supplier of the best quality of Copper Nickels Flanges. We have been in this business for the past decade of years, we always try to ensure the faultlessness of these flanges, and hence we perform a proper inspection of the quality of the raw material before putting them to use in the manufacturing process. We maintain a broad inventory of Cupro Nickel Pipe Flanges that are available in grades like Cu-Ni 90/10, Cu-Ni 70/30 etc. These grades of flanges have proven themselves to be efficiently resistant to seawater, brine water, organic compounds, salts, diluted non-oxidizing acids, and much more. Because of their high resistance towards marine organisms such as barnacles, their use in seawater piping systems is known to be extremely common and valued. Apart from this, the various forms of Cu-Ni flanges available at Jaydeep Steels are Cupro Nickel Slip on Flanges, Cupro Nickel Blind Flanges, Cupro Nickel Weld Neck Flanges, Cupro Nickel Socket Weld Flanges, Cupro Nickel Threaded Flanges, Cupro Nickel Lap Joint Flanges, and much more. We make use of cutting-edge devices and machines for preparing the flanges that are used in the industries. Further, we also stay aware to adhere ourselves to the quality standards of the manufacturing processes, so as to achieve the wants and needs set by our customers. Various industries purchase these cupro nickel flanges for their typical applications like Seawater piping systems, Pressure vessels piping outlets, etc., in a mass amount from us at the reasonable rates set by us. 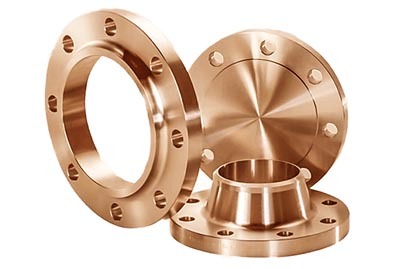 Contact us to request a free quote or speak with one of our sales personnel regarding our copper flanges need. Jaydeep Steels stocks a wide range of materials and grades. Below is a list of all standard copper-nickel alloy flanges materials and grades we stock. Our experienced team of metal experts will get you the metal you need when you need it. Call us today for your Copper Nickel Alloy Flanges Needs!